I think I have shared with you before that I am NOT a builder. This tutorial will help other non-builder's make fun pieces for decorating their homes. 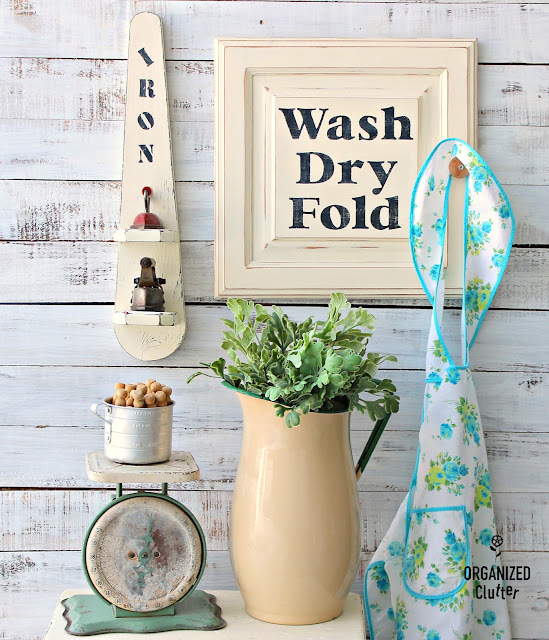 This display shelf project started with this small ironing board and napkin holder purchased at a thrift shop. The ironing board had some metal brackets on the back for a stand that had to be removed. The holes left by the bracket were filled with wood putty, and the putty was sanded when dry. Then I measured my two miniature irons from front to back. One was 3 1/2" and the other 4". I sized my napkin holder sides with about an inch of difference in length. I love this type of project. The napkin holder sides have a nice shape and are finished, unlike using a piece of scrap wood. Easy all the way! Then the napkin holder sides that are now SHELVES are screwed in from the back of the ironing board and a sawtooth hanger is added at the top. I rarely use the nails that come with the sawtooths, especially when I will be displaying irons. I used a little longer nails. I base coated my shelf with Rustoleum Painter's Touch satin paint in Canyon Black, and then brushed on two coats of ASCP in Old White. I then sanded the piece with 220 grit sandpaper and stenciled on the word "IRON" with Darice Poster 1" Alphabet Stencils. I also waxed the shelf with DecorArt Americana Creme Wax. The top miniature iron is a vintage Lady Dover toy iron, and the bottom one, my mom tells me is a salesman's sample. This is my farmhouse style laundry room, with my kitchen through the doorway to the left. I love decorating my laundry room because it's seen every day not just for laundry but just passing through. Carlene - SO CUTE! Love them. You think of the cutest things. Amazing! Thank you for sharing!!! You are amazing. Can't wait to see what you do in the garden this year too. Such a fun thing to collect and you've made the perfect display! I love your repurpose! This will be featured this Tuesday on Talk of the Town. Thank you for linking up. How cute, now if I only had a laundry room! Love, love, love. I have the same in my laundry room. 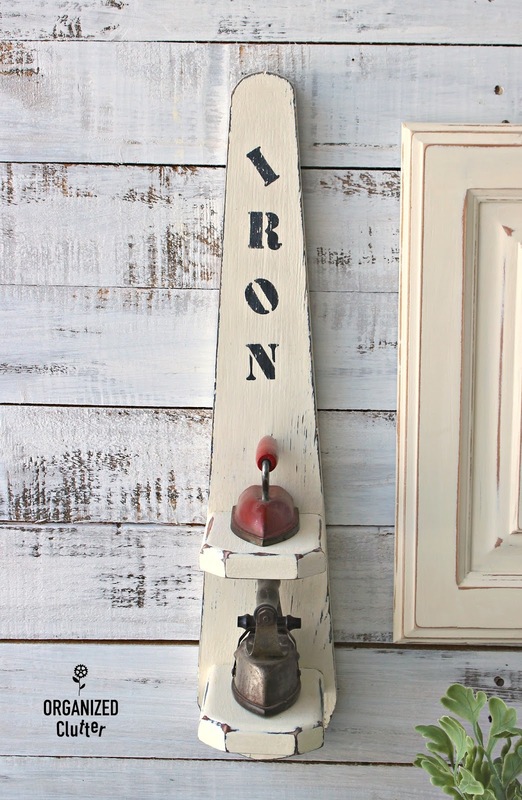 I have my mom's wooden ironing board and two old her vintage irons. Also 3 washboards.